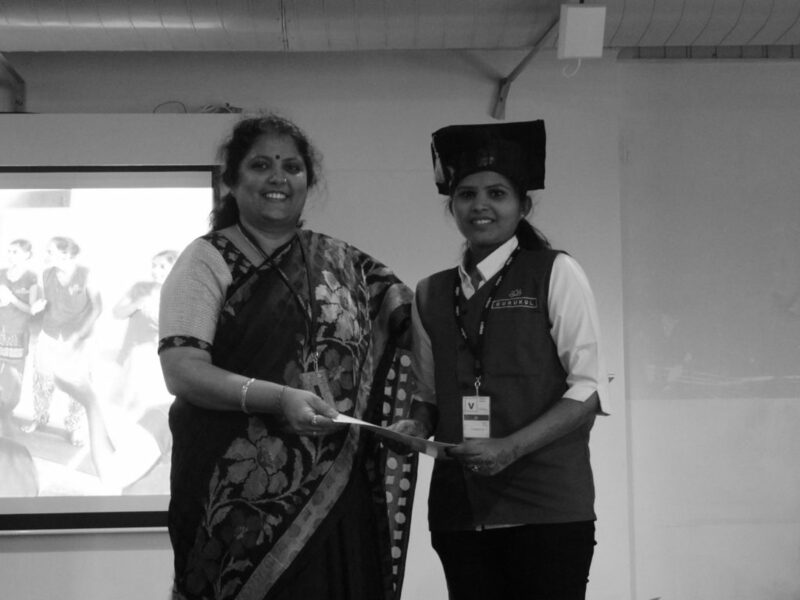 14-year old Shrinidhi Suneeth attended the Gurukul graduation ceremony of 125 underprivileged youth recently when she accompanied her mother Neeti Tolia, Engineering Director, Unisys India. Soon after attending the event, Shrinidhi shared a note with all her friends and family. Here is her note, in her own words. Today, I experienced the most beautiful thing I ever have. I spent an hour or two with a wonderful set of students learning something new. They put in 3 months of sincere dedication and hard work to gain skills for a livelihood. It was a wonderful sight to see all of them flying high and achieving something new. The enthusiasm and the thrill they got into throwing their caps high in the air was something we were all very happy to witness.Their lovely smiles and positive attitude helped them reach a height they thought they could have never achieved, but they did! The/Nudge Foundation was the organisation behind the success of these 125 souls from poor communities, who were looking forward to prove themselves in a society which underestimated their potential. They began on a positive note with the National Anthem. They took a pledge that they will rise every time they fall and also put in a lot of effort to make their life a success. All of them came from a humble background and with zero knowledge of the English language. But within a short span of 3 months, they learnt the language and spoke in front of a large audience. Not everyone could share the behind-the-scenes of their lives. One girl stepped up and shared her story. Her life story reminded us of the phoenix, that rises from its ashes and starts its life all over again. A panel discussion with the moderators was held where a few of these students talked about their whole experience at The/Nudge’s Gurukul. Inspirational speeches were given by the members of the host organisation, Unisys. After this we reached the part where each of the achievers was given a certificate. Each of them had their name written in bold letters with their achievement right underneath it. Do you remember how we felt when we held a certificate saying that we had won a competition? Well, that was huge for us because getting a certificate from the Principal was a great deal for those at school. But this is a different story all together. The fact that they had put in so much effort to learn what they wanted to with full determination, and achieved their goals is an attitude we all salute. They all knew they had come a long way from where they began. They started out as people with the least knowledge about the skill but are now well trained and ready to work professionally! They put their best foot forward to move towards a life where the world was going to test their ability in various ways, and their determination not to give up is a learning for all of us. We, the people to whom education comes so easily, should thank our stars for giving us a family which could afford our education. They supported us at every step of life and encouraged us. We should take a moment, get off our screens and think, what kind of a life we are living, a life in which we get everything we want. There are people who are struggling to earn one meal everyday. Be grateful for what you have because not everyone has what they want. Tears of joy, of achieving something new was in each students’ eyes. They trained to be the successful students who will be seen driving cars, doing makeup in beauty salons and managing sales of big corporate companies. Hoping to see these dreamers reach their goal sometime soon! 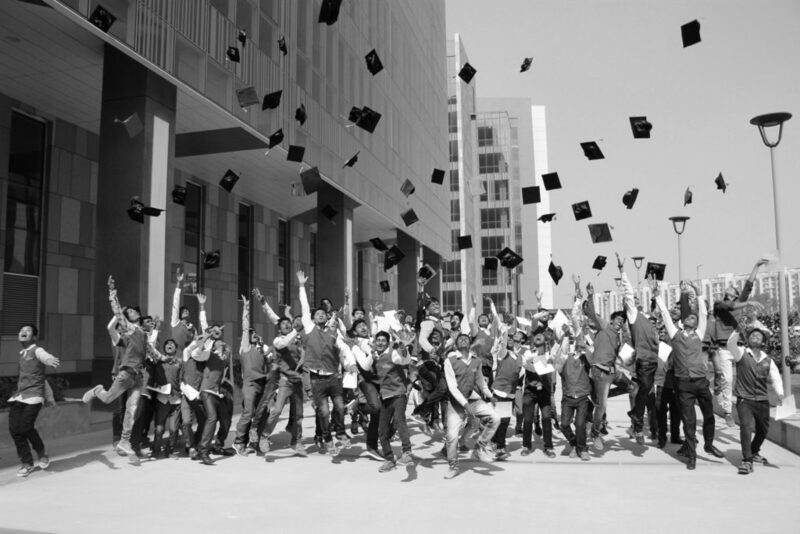 Thank you Shrinidhi for your moving account of the graduation ceremony! Your words encourage our students even more to achieve their dreams! 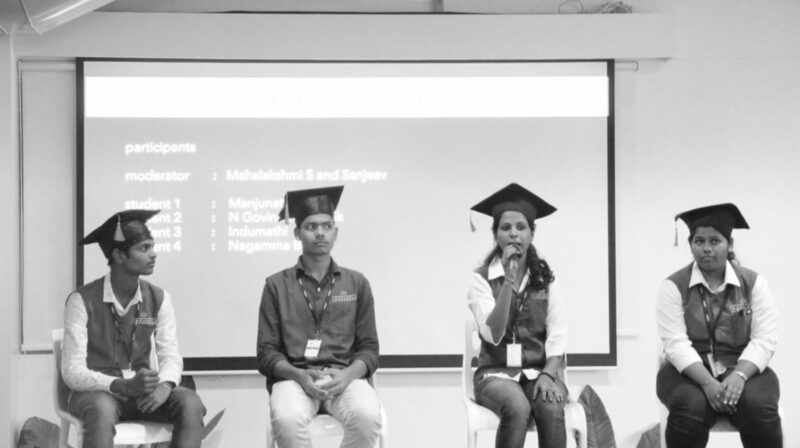 This batch of Gurukul was supported by BookASmile (charity initiative of BookMyShow), Cisco, H T Parekh Foundation, and Mphasis who have been constantly helping us nudge underprivileged youth out of poverty. A special thanks to Unisys India for being such gracious hosts for the ceremony!  Archived in Guest Post and tagged Education, graduate, Gurukul, poor, Poverty, Poverty Alleviation, SkillIndia, skilling, The/Nudge, Unisys, youth. Bookmark the permalink.